With Thanksgiving just a couple of weeks away, some people might be starting to plan their menus for the big day. At most traditional Thanksgiving gatherings, the average person will be holding a wine glass when it comes time to wash down the turkey and trimmings. But, before making the choice for wine, you should consider the argument for beer. Orval – This would be a perfect beer to serve pre-dinner. It’s a refreshingly bitter and herbal beer that helps to cleanse the palate between different appetizers. One of my favorite beers of all time. Any Biere de Garde – I do not have much experience with this style of beer, but according to Mr. Oliver these complex beers are perfect compliments to dishes with strong herbal components (such as stuffing) and help to refresh the palate. I’d head to a local bottle shop and ask for suggestions. Elysian The Wise ESB – If you’re looking for a more hop-forward beer for dinner, this would be a good option. There is plenty of sweet malt to go along with the roasted flavors of the turkey. I once brined an entire turkey in Elysian ESB overnight and then served it with the beer for dinner; amazing. Local Winter Ales – Winter ales are usually malt-forward and should pair well with what you’re having for dinner. There are plenty around; a quick trip to the grocery store or bottle shop and you’ll find several options. I’d suggest grabbing a growler fill of one of my new favorites, the Big Al Winter Warmer. North Coast Old Rasputin Russian Imperial Stout – This would be a fantastic choice to pair with dessert, especially pumpkin pie. It has lots of roasted malt with a dry, smooth finish. I know what I’m thankful for this year. I’m thankful that Seattle has so much good beer to drink! Please, if you have any Thanksgiving pairing favorites feel free to leave a comment. People tend to get their fill of oktoberfest/märzen lagers in September and October, but the style also pairs really well with traditional Thanksgiving food. Also, Widmer’s 84/09 Double Alt would make a great choice at the table. I opened up a bottle of this a few weeks ago and the flavors had really come together. Also, the 9.8% ABV was pretty stealthy. Harvest Ales work great, and Rogue’s Fresh Wet Hop Ale would make a nice turkey pairing. Oh, yeah…fresh hop beers would be a fantastic pairing. Good call. GCM – I don’t think I ever had a chance to try that one. 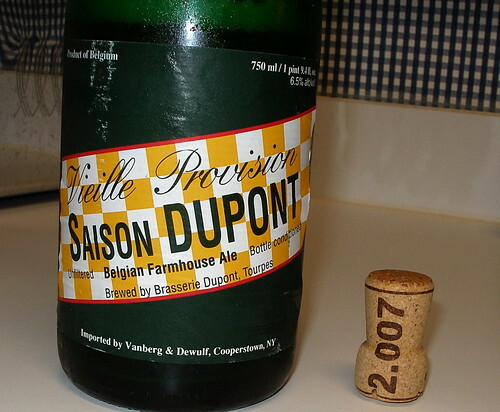 im also an Oliver follower, used to get Saison Dupont at a ‘Bristol Farms’ in S.D. Anyone know where to get it up here? I started planning my Thanksgiving meal the other day; beer included. We are doing a very small gathering this year and with my wife being a vegetarian, the only meat being served is the turkey. This steered me away from the heavier seasonals. I plan on serving Hennepin before dinner and both Rogue’s Brutal Bitter and Oakshire’s Ill Tempered Gnome during. I may brake out a bottle of Abyss afterward if anyone is in the mood. One Thanksgiving I cracked an Anchor Our Special Ale. It paired really well with all the food! Pat – any of the links on the left side of the page for “Beer Retailers” should have Saison DuPont. This is my favorite time of the year for beer. It’s so much easier to find non-hop-heavy brews. But when you said “…and help to refresh the pallet…” I think you really meant “palate”. Pike Auld Acquaintance paired perfectly with turkey, yams, garlic green beans and of course, pumpkin pie with cinnamon whipped cream last night at the new Interbay Whole Foods fundraiser for the Pike Place Market Food Bank. XXXXX Stout was stunning with the Penn Cove Select oysters appetizer. You should have been there! It just confirmed what we already knew about Pike beers…they are brewed to go with food. May I recommend Urthel Hop-it for your Thanksgiving feast. This Belgian IPA has citrus-hop notes that are well balanced with malt, giving it refreshing contrast from rich food without being overly bitter. The Belgian yeast produces wonderful spice (cinnamon, clove) notes that are perfect with the Thanksgiving menu as well. And at 9.5%, you are sure to have a merry holiday! anyone find Castelain in stock? checked out the Pike St, De Laurenti in Pike Place, and both Capitol Hill Qfc’s with no luck.